One of those rows isn't sewn on yet, it's just pinned and folded over for this photo. I did manage to get all of the blocks pieced and the rows put together. Now I'm just trying to blow through the sashing so I can move this quilt into the sandwiching phase. In the crazy perfect world that I pretend to live in, I will have binding on both the pink and blue quilts on Friday night. Now that I type it out, it does seem really crazy. That's still my goal, though. Sometimes you just have to go for crazy. I really like the way that all of the pieced blocks turned out. I also sewed them all into their rows with the correct orientation. Not so much for the pink quilt. Don't worry, I'll show photos of them when they're both done so you can appreciate the goofiness of my little mistake. I did go to the trouble to fussy cut this little bird on a branch. Hi birdie! He's so precious. 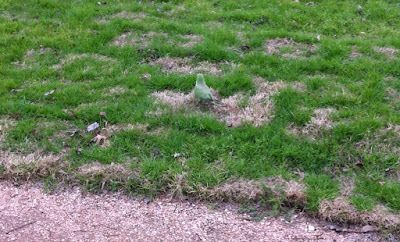 I followed around a little green quaker parrot while waiting for lunch today. 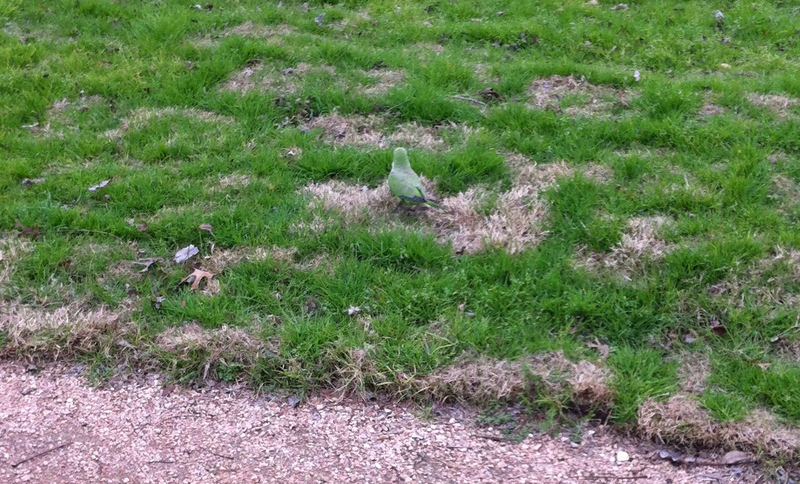 He's part of a wild flock that lives in Austin. I'm in love with them. I hope your Tuesday was full of nice birdies, too!